Game of Thrones throw pillow! Velveteen textured fabric with gilded rope trim. Measures 22-inches tall and includes House motto "Growing Strong." Features the House Tyrell coat of arms of golden rose on a green field. Bring a touch of Westeros to your home with the Game of Thrones House Tyrell Rose Throw Pillow! Each pillow is crafted from exquisite velveteen textured fabric in the shape of a heraldic shield and features gold rope trim. 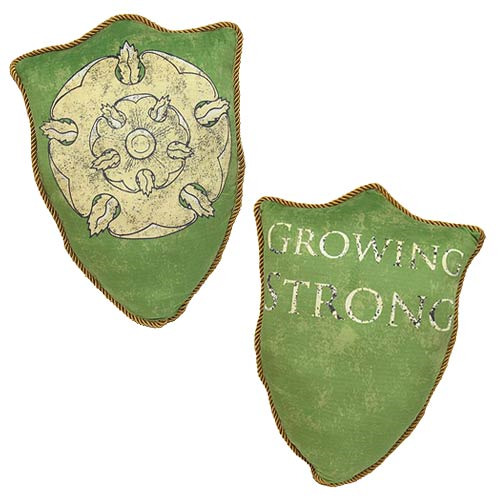 The House Tyrell pillow measures 22-inches tall and presents the coat of arms of House Tyrell with the golden rose on a green field. Pillows are supplied vacuum packed for ease of transport.